You expect a lot from an Impact Resistant Window Company, but then again so do we. Quality construction that what it’s all about. That’s why we’re so confident that Rolladen’s Impact Resistant Aluminum and Vinyl window and door lines represent some of the best thinking in the industry. And it’s why once you see them for yourself, you will agree. Beautiful designs. Dependable performance. Unmistakable details. After all, you wouldn’t settle for anything less. So, why would we. At Rolladen our impact resistant window and door products work with the most advanced engineered systems to ensure superior quality and the best product function with the highest ratings of energy efficiency, noise reduction and protection. We work with only the most reputable and qualified manufacturers in the industry. Our product selection is tested to meet the highest design load standards for air and water infiltration, including the stringent standards imposed by either Miami-Dade, AAMA, ASTM and the Florida Building Code. When you live in Florida, hurricanes are a part of your life. We would like you to think about something now … before the next hurricane … With your current windows and doors, do you feel safe and secure, or would your family be vulnerable to flying debris from the strong winds of a hurricane? With Rolladen Impact Windows and Doors, there is no doubt. We approach each project with a sense of ownership and pride in workmanship that you can trust. We invite you to look through our wide selection of impact-resistant windows, impact resistant doors and other hurricane protection products. Each has been designed to meet Florida’s stringent building codes. They are strong and elegant to help give you peace of mind and long life product performance. Our Aluminum Impact Resistant Windows and Doors also have some of the strongest aluminum frames available to prevent bending during installation or rattling and pulling with use. Interlayers are of the highest performing on the market for full protection-DuPont, SentryGlas Plus (SGP), Polyvinyl Butyral (PVB) are used on the products we carry. 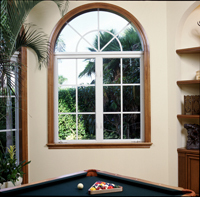 Our Vinyl Impact Resistant Windows and doors never need painting or refinishing, and won’t rot, crack, rust or peel. Vinyl is an excellent insulator, and is perfect for constructing tight seals that prevent leaky drafts, helping you save on heating and cooling costs all year round. Color is molded completely through the vinyl profiles to make it easy to clean and maintenance-free. Our Impact resistant windows and doors can help breathe new life into any room in your home. At most companies, making windows is a business. At Rolladen, it is also an art. An old world European tradition of superb design and excellent fit. 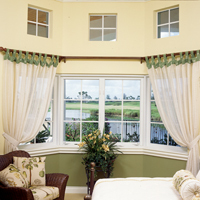 Call now to see if you qualify for a 30% florida tax credit on windows and doors. Superb design because there is no compromise when it comes to the safety of your family. And that’s why, unlike most companies that make replacement windows, Rolladen carries, not only the usual standard sizes, but we manufacture a vast selection of shapes and sizes. Our replacement windows are custom made. There are no unsightly aluminum fillers. There are no surprises. At Rolladen we’ve been helping protect Floridians against unwanted intruders, hurricanes and the sun’s damaging UV rays since 1968. So when it came to designing and manufacturing our exclusive BeautyGuard High Impact windows, we naturally wanted it to be the best looking substitute for hurricane shutters around. 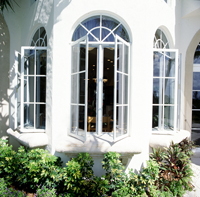 All BeautyGuard windows meet the stingent South Florida and Miami Building Codes; which means they meet impact and pressure standards for residential and commercial applications. In addition they can significantly reduce your energy bills while insulating your home or business from unwanted noise. Rolladen BeautyGuard picture windows, casements, single hungs, horizontal rolling, geometries, sliding glass doors and French doors are sure to beautify your home. Sure to increase the functionality and resale value of your property. And sure to match the size of windows you’re replacing. So if you are considering windows for your home or business, don’t settle for just any window. Call the company that has been setting industry standards for quality since 1968. Call the specialists at Rolladen for a free demonstration and ask about our BeautyGuard windows. How wind can affect your home. You know that hurricane winds can cause tremendous property loss, but what you may not know is that a large amount of the damage is actually caused by wind-borne debris (such as tree limbs, signs, roof, tiles, etc.) and not the wind itself. Debris penetrates windows and doors, allowing the wind to enter a home. This creates forces that the structure of the house is not designed to withstand, often lifting the roof or pushing out the walls and causing them to fail. Even if the roof and walls remain intact, the rain and water damage from a broken window can be severe, leaving a home uninhabitable and resulting in a total loss of its contents. Protecting your property, protecting yourself. Many coastal areas across the country now have building codes requiring wind-borne debris protection in hurricane-prone areas. While builders and architects should be aware of the code requirements, you must protect yourself by ensuring that products used in your home meet code requirements. Because not all impact-resistant windows or shutters meet code. You should ask to see one of the following test reports for the products being used and verify acceptance with your local building department.